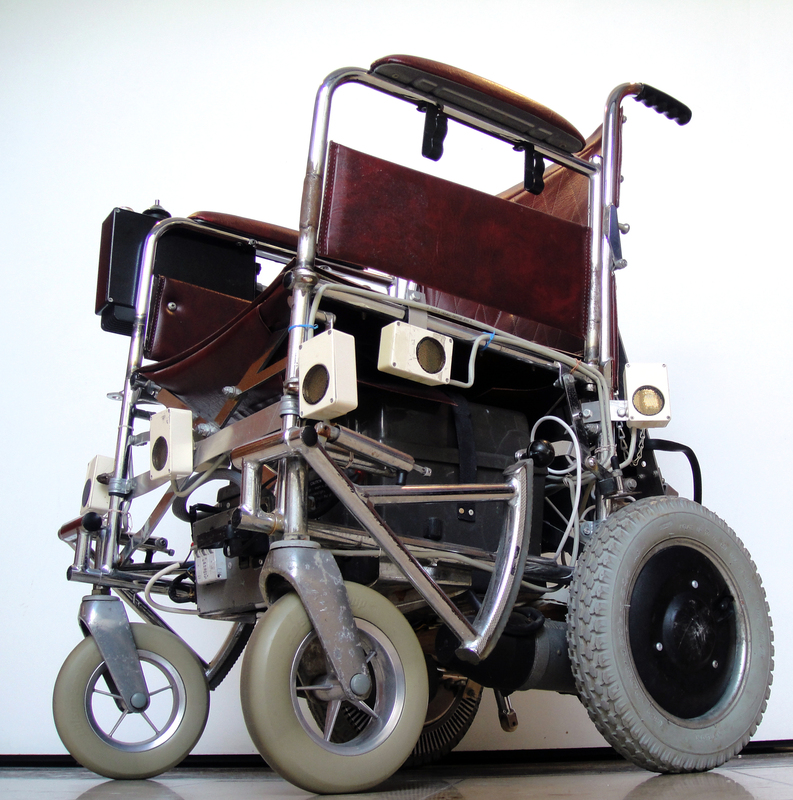 Psalms is the Autonomous Wheelchair constructed by Guido Bugmann for Donald Rodney’s “Nine Night in Eldorado” at the South London Gallery, 1997. Psalms in action at the opening of “Nine Night in Eldorado” at the South London Gallery 1997. ‘The political significance of Rodney’s work should not be underestimated, nor his legacy which continues to inspire younger artists.’ (Keith Piper, Co-curator). 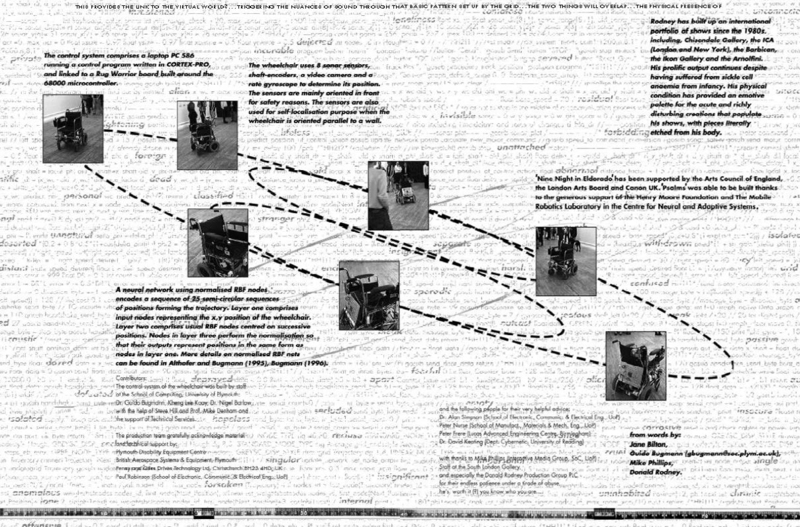 The web page by Dr Guido Bugmann tracks the various installations and technical details for the commision. 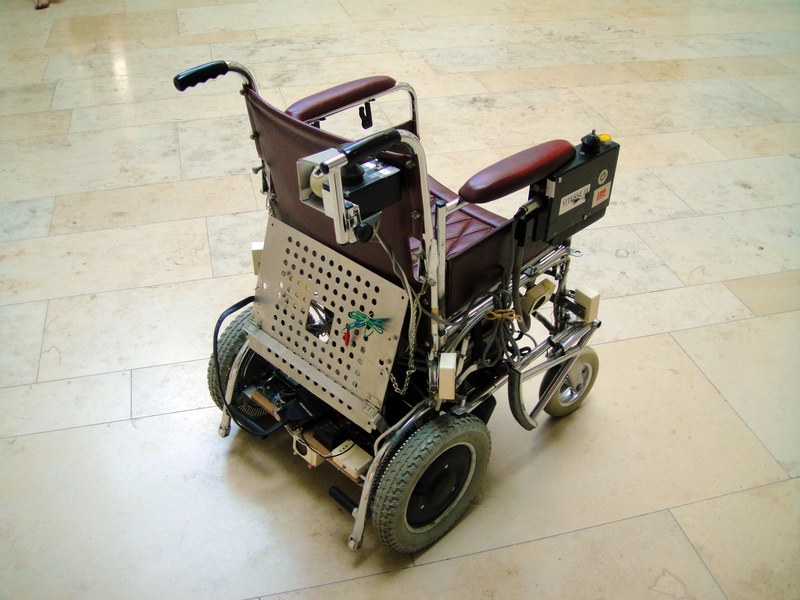 The wheelchair uses 8 sonar sensors, shaft-encoders, a video camera and a rate gyroscope to determine its position. A neural network using normalised RBF nodes encodes the sequence of 25 semi-circular sequences of positions forming the trajectory. 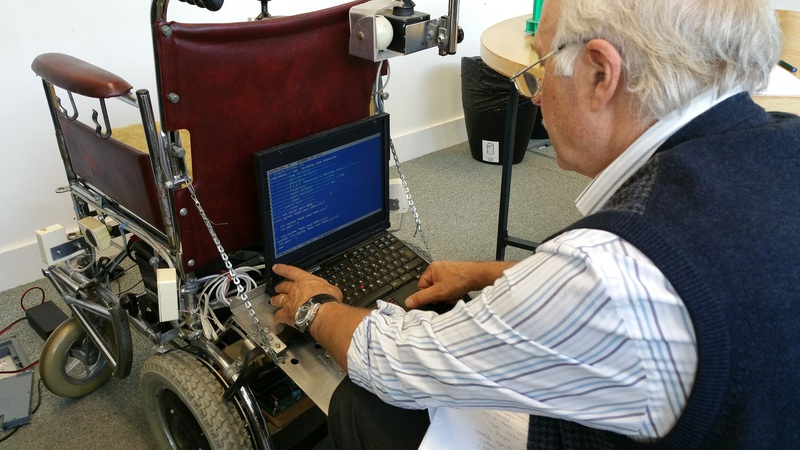 The control system comprises a laptop PC 586 running a control program written in CORTEX-PRO, and linked to a Rug Warrior board built around the 68000 microcontroller. /button "QC init", "gosub Houghinitqc"
button "Reset Shaft", "gosub reset_shaft_position_to_zero"
button "Track Pos. ", "gosub procedure_track_position"
/*HS! !2*/// define section list // new - need to reflect in "build trajectory"
// needs to be in ascending order for now. // here we decide where he starts and where he looks. // in the final program, he will find out by himself. // phi_wc = 0 // towards right. // phi_wc = PI/2 - 0.35 //North, slightly to the East. float base_speed = 20 // 15 //13 //what is the max? print "PRESS ANY KEY TO STOP (but not ESC)." 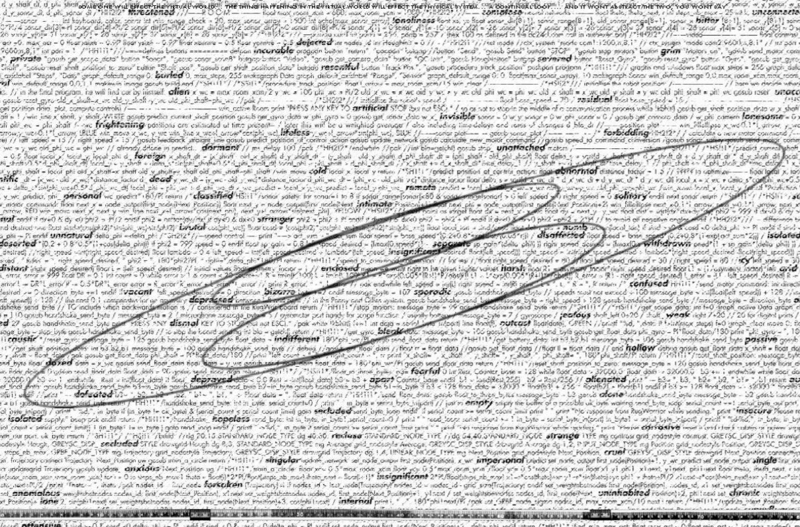 print "STOP AFTER ESCAPE MANOEUVRE"
print "SQUEEZED ON BOTH SIDES"
//print "STOP AFTER ESCAPE MANOEUVRE" - now done inside each if above. // 0.94= times in seconds to send back a value in phase with RugW. 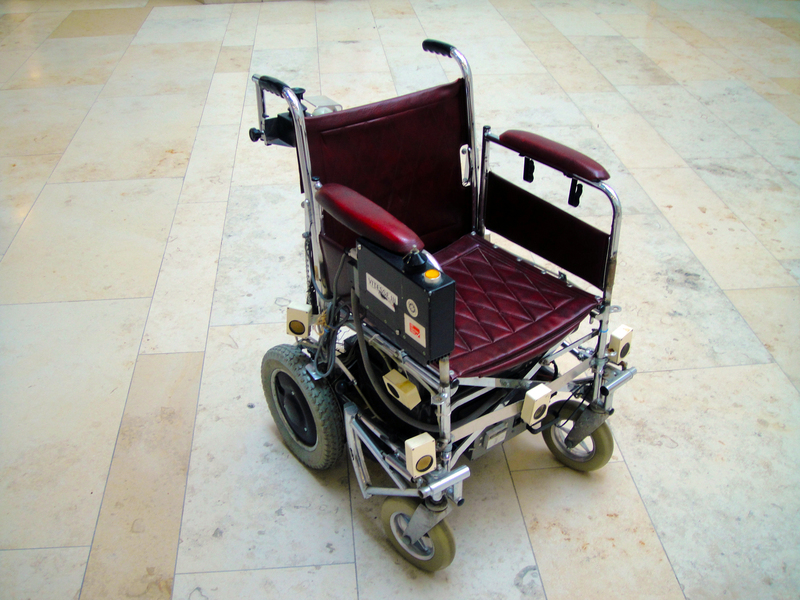 // This routine stops the wheelchair until the obstacle has moved. // returned to the main loop which will execute an escape movement. // idea, not do all front sonars one after the other, to avoid stray echos? //print "NO OBSTACLES : SAFE"
/ a that point in the program, we still use the previous value of phi_wc. // this tolerance should be dependent on the angular velocity. // the tolerance should increase. /*HS! !1*/send_motor_command: //motor bias in here. // in the Penny and Gilles system. // seems to be thr other way now (Nov 2009) right wheel is slugish. / gb 23.02.03 : gyro not used. print "No response from RugWarrior while sending." print "Please press ESC, and reset the RugWarrior board." print "No response from RugWarrior while reading." print "Please reset it and check cables or power supply." float dist_from_back_wall = 150 //not used? print "======> Section nb = ", node_output(first_node(Sequence_State))/section_boost, " <====="
// from the last state, jump to the 12th. Old version. // avoiding section 1. Unclear why. // use sin and cos to calculate the next angle put into the 3rd node. /*HS! !1*/get_sonar_data: //for self localization -used? // down of the data reading after a few seconds. // port 96 is the keyboard chip 8255A (hex 60). next iix //this delay also shifts the palce of the echo in the array. port_out porta,0 // reset all inputs? //print "Sonar ", sonar, ", range = ",i_dist, " (dt1=",dt," dt2=",elapsed_time(1),")"